National discount retailer Dollar Tree plans to open a store in Exeter by fall in the former Nickel’s Payless grocery location. Owner of the property Steve Richmond confirms a lease for 18,000 sf in the building adjacent to his Rancho Pharmacy on Kaweah Ave.
Dollar Tree has applied for a city building permit to do tenant improvements. Richmond estimates the work could take four months. Dollar Tree is one of three fast growing chains of dollar stores being opened across the nation and here in Tulare County. The retailer has six locations in the county including one in Farmersville and a location scheduled to open later this year in Lindsay. Besides Dollar Tree – Exeter is likely to get a new Dollar General outlet with representatives of the company recently huddling with city officials discussing alternative sites for the new store to be built in town says planner Greg Collins. The company is now building a new from-the-ground-up store in Woodlake. In Exeter the arrival of Dollar Tree to the Highway 65 shopping center will fill the anchor position in the commercial center that lost its major grocer about 15 years ago followed by a furniture retailer that closed some three years ago. It should boost business for other retailers in this part of town. 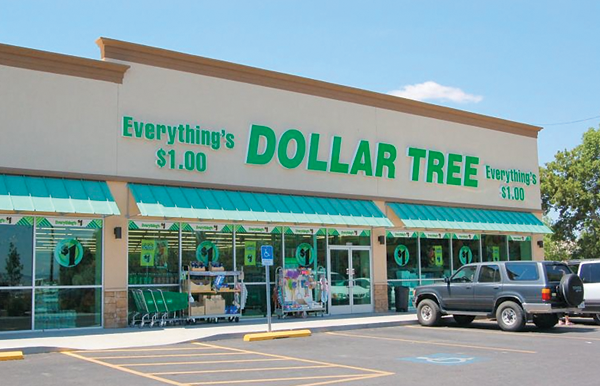 Dollar Tree is a Virginia-based chain of discount variety stores that sells every item for $1.00 or less. The Nasdaq-traded company reported $7.39 billion in sales in the latest fiscal year – 11.5% higher than the year before. They operate nearly 4700 locations nationwide. Departments found in a Dollar Tree store include health and beauty, food and snacks, party, seasonal décor, housewares, glassware, dinnerware, household cleaning supplies, candy, toys, gifts, gift bags and wrap, stationery, craft supplies, teaching supplies and books. Some Dollar Tree stores also sell frozen foods and dairy items such as milk, eggs, pizza, ice cream, frozen dinners, and pre-made baked goods. In August 2012, the company began accepting manufacturer’s coupons at all of its store locations.